Diamond Select Toys has graciously sent me some figures and collectibles to review and what we have here is an officially licensed Universal Monsters Frankenstein MiniMates playset. I have seen toys from this line of figures before. MiniMates are very much like Legos or Mega Bloks, but these are alot more cooler and appealing to those who are fans of either the films, comics, TV shows, or games that the figures are made to be like. 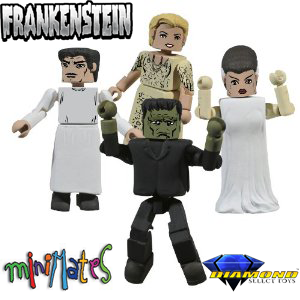 In this particular set you will get Frankenstein's Monster, Dr. Frankenstein, The Bride of Frankenstein, and also Elizabeth. On with the autopsy! Look and Detail: The look of these figures are amazing and the detail of how they look is spot on to the characters they are made after even down to the staple in the Monster's head. The detail in the paint job is excellent and they did not just skip out on the details on the clothing. I really like how the detail of the bandages on Bride of Frankenstein's arms are actually on this figure. Most companies would probably just skip over that detail and just make the arms an off white color and that is it. They even made sure that the Monster has his protruding forehead. The level of detail that they did on the faces is very well done. From the eyes to the wrinkles you get a very high level of detail. Even the hair has a texture to it that just adds that much more authenticity to it. Articulation: The articulation of these figures are quite good, but there really only is one flaw if you do actually plan on playing with them or giving them to a kid to play. The only thing that would be a flaw is clothing that Bride of Frankenstein wear, the dress Elizabeth wears, and the bottom part of Dr. Frankenstein's apron. The problem is that it gets in the way of posing the character in say a walking stance. Now the Bride of Frankenstein's dress is flexible. For the most part I think most collectors will just buy these and either pose them or keep them in the package so that one little flaw won't mean much. The arms have great flexibility and even bend at the elbow and when it comes to the head it can turn around 360 degrees.The legs are very flexible especially for Frankenstein's Monster. Also these figures do come apart to an extent which came make for a little fun if you want to fix up the characters parts. Accessories: In this set you do not get any accessories to go with the figures. All you get is the 4 figures and that is about it. Now if they would of had say a figure of Igor in the set they could of had an accessory of the jar with the abnormal brain in it. Other than that there really is nothing I could think of that they could of added as an accessory so it doesn't have that feeling that it is missing anything. Overall these are some very well crafted figures that have a great deal of detail and do the characters from the 1931 Frankenstein & 1935 Bride of Frankenstein superbly. I highly recommend these to anyone who is a collector and fan of the classic Universal Monster films. If you are interested in purchasing this set you can go get it at www.diamondselecttoys.com for $17.99 + shipping. I would love to see them make a playset of Dr. Frankenstein's lab to pose these figures on. I give this set 5 out of 5 scalpels!